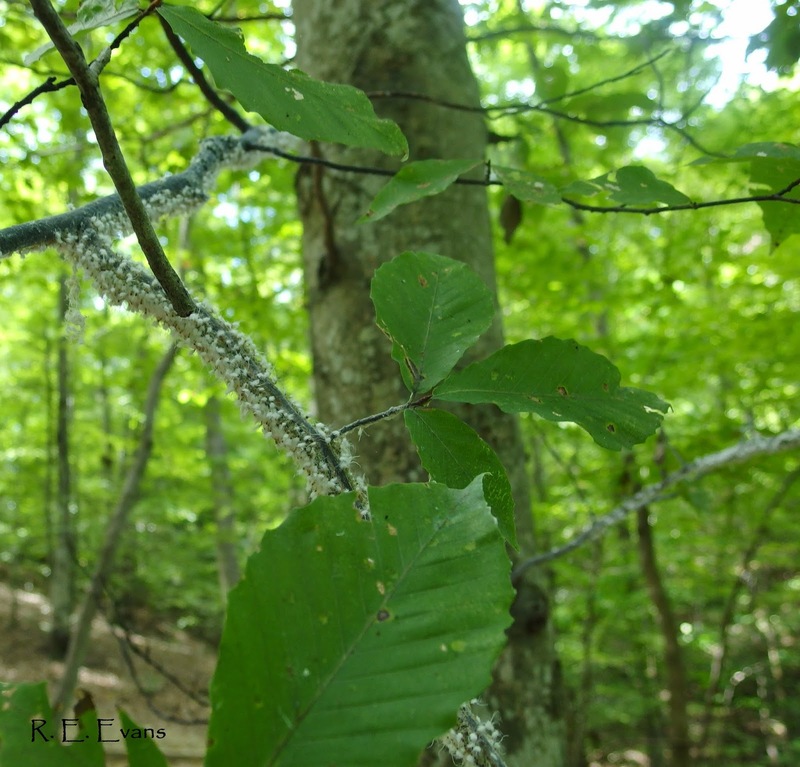 American Beech (Fagus grandifolia) is a common and distinctive tree found across much of eastern North America. It is most often found on moist, acidic sites where it grows slowly, but lives long as a component of late successional, minimally disturbed forests. 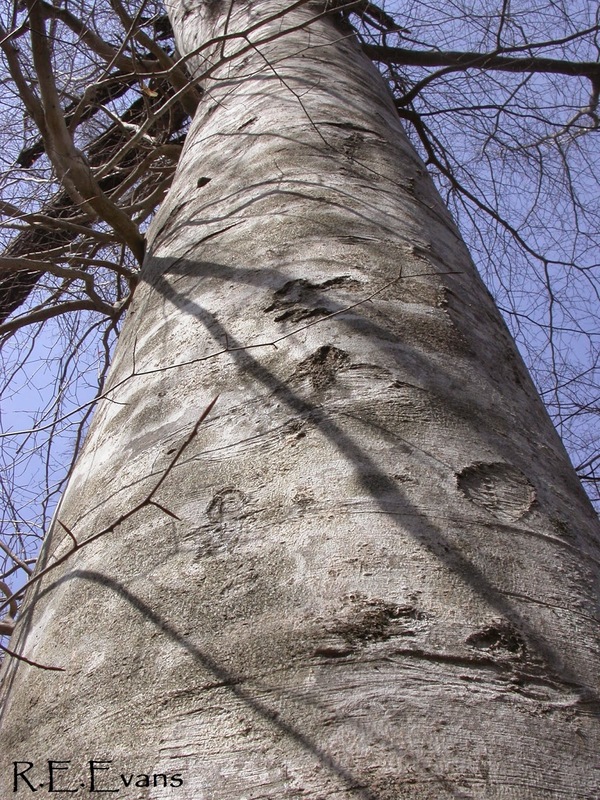 The smooth, silver bark gives American beech an almost elegant appearance compared to rough barked species it is often associated with. However, this bark is quite thin and makes the tree susceptible to a variety of "damaging agents" (1). Careful observation during the late summer & early fall may reveal signs of one of the more unusual of these "damaging agents". There are at least 4 different but closely related signs to look for. The first of these symptoms is defoliation or apparent die-off of limbs, usually evident on the lower branches, prior to normal leaves turning color or shedding. In extreme cases, like the tree shown above, all lower limbs may be barren of live leaves. More commonly, only a single limb or two may be affected. 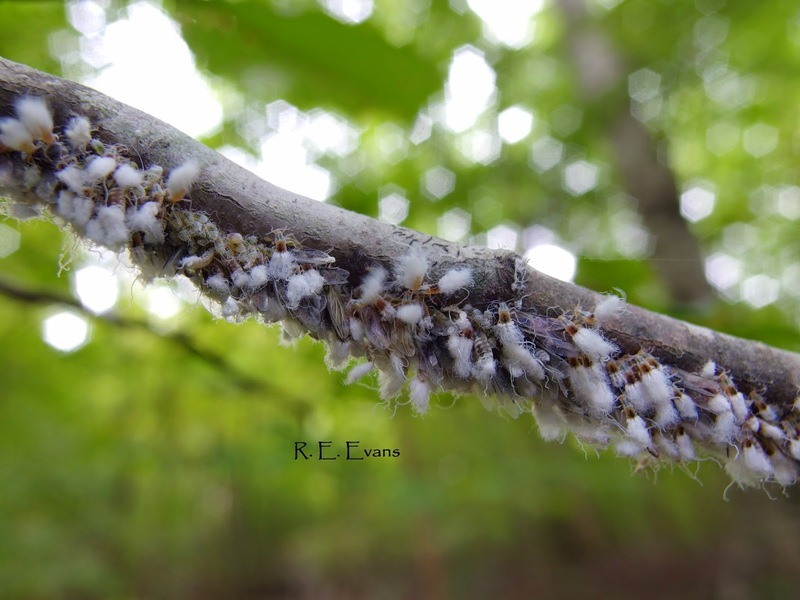 Sometimes the culprit can be found in the process of causing defoliation on twigs that appear to be covered in a dense white, cottony fuzz. The fuzz is actually hundreds or thousands of colonial aphids. When approached closely, they wave and gyrate possibly as a defensive mechanism. 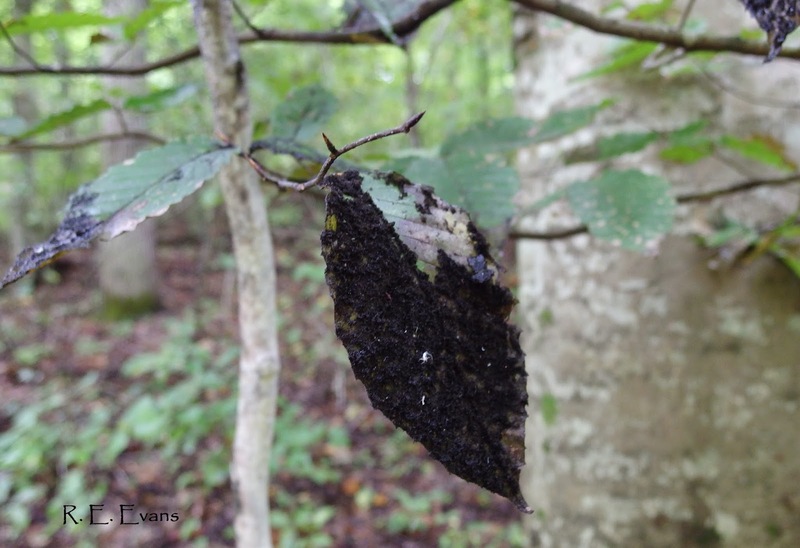 The aphids (Grylloprociphilus imbricator) feed by sucking sap from the living beech tissue (possibly aided by the thin bark). Each colony includes individuals of different developmental stages or "instars". For example, on the image above, both winged and non-winged individuals can be observed as well as some individuals with varying degrees of plumage emanating from the rear abdomen (the later generations). As they feed, the aphids deposit "honeydew" or excrement on surfaces below. This honeydew begins to be colonized by sooty molds that give the appearance of black liquid tar. These patches are easy to spot and often persist for at least 2 seasons. The honeydew provides an attractant to numerous insects (see image left). For unknown reasons, possibly the quantity of honeydew, some substrates develop dense masses of sooty molds not just thin black films. The sooty molds apparently don't penetrate leaves but dense patches seem to be able to limit or completely block photosynthesis. Not surprisingly, tree seedlings underneath aphid colonies suffer greater mortality than unaffected seedlings (2). I have observed several herbaceous and shrub species being negatively affected in this way, including Hepatica, Christmas Fern, and Mountain Laurel. This process could account for the relative lack of other species of plants around some American Beech stems (see image at top of page). (2) Cook-Patton. S.C., L. Maynard, N.P. Lemoine, J. Shue, and J.D. Parker. 2014. 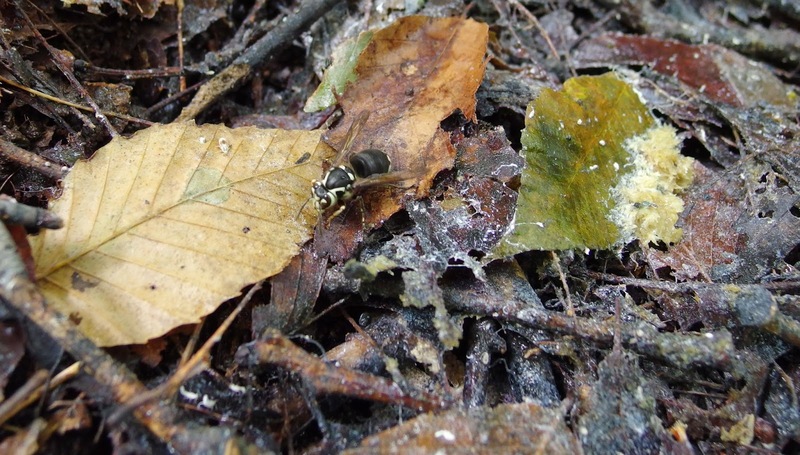 Cascading effects of a highly specialized beech-aphid-fungus interaction on forest regeneration. PeerJ.